Over the last several months, I have been looking at the real estate market in Portland. Last week, I put in an offer. I didn’t end up getting the place, but I am not sad about it. I decided to back off, and stop looking for a while, and see where life takes me. When I put in my offer, though, I was interested to know what this mortgage would cost me, all in. So, like all things, I went to the internet, asked my question, and got a pretty decent answer. 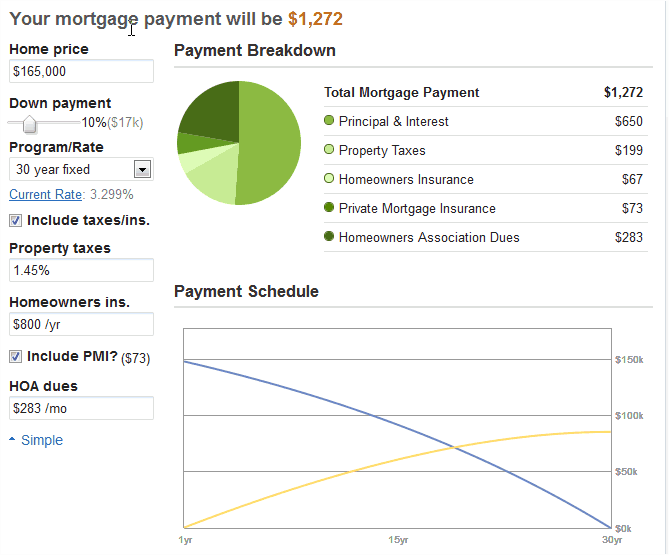 The calculator is used was on Zillow, but there are a million other mortgage calculators out there. My total payments would be $1272. Not bad. A bit more than I’m paying now, but the condo had three bedrooms and two bathrooms! So, completely doable. Especially if I wait until I’m completely out of debt, then there would be two payments I’m no longer making. I noticed, though, in the upper left hand corner, a drop-down menu. It was set on 30-year-fixed, which is what everyone does. Right? Curious, I changed it to a 15-year-fixed, fully expecting that number to double, or nearly double. But a funny thing happened. Now, don’t tease me, but this was truly the first time I saw the magic of compound interest at work. 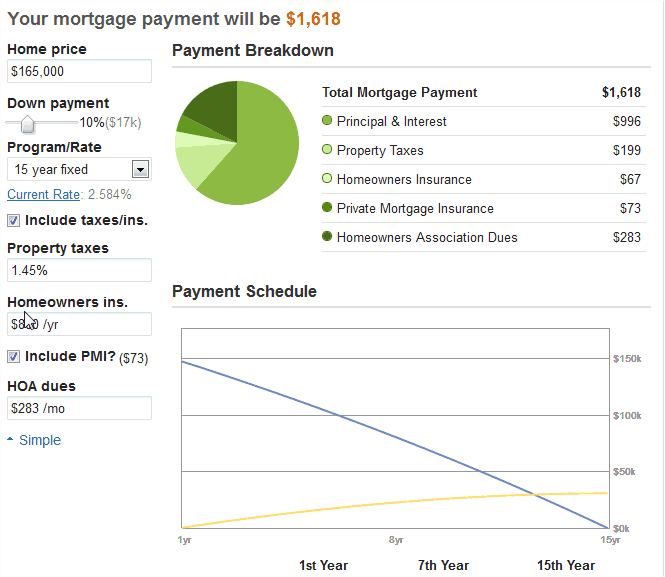 Reducing the time from 30 to 15 years only changed my minimum mortgage payment by $346. I scratched my head, thinking, no, this can’t be the case. And here’s what I learned: the reason they push you into a longer term is so they get more money! The interest rate drops by 3/4 of a percent, and paying an extra $346 a month for 15 years means I would no longer have a mortgage in 15 years! Now, I’m not all that comfortable committing to that high of a payment, when right now, my rent and utilities sit pretty at $825 a month. But it got me thinking. One, I’m glad, actually, that I didn’t get that condo. It wasn’t perfect. It was fine, and lovely, and would have worked, but it was a little too far away, and I wouldn’t be able to get rid of my car and live close-in like I had been dreaming about doing. It was still inside the city limits, but not walking distance to anything fun. Two, I’m happy to spend this year getting rid of the last bits of consumer debt (less than $5K total on the student loan and the car loan) and start saving. I’ll increase my earning potential (if that raise I asked for ever gets put into place!) and I’ll only buy something when I can afford to do a 15-year mortgage. 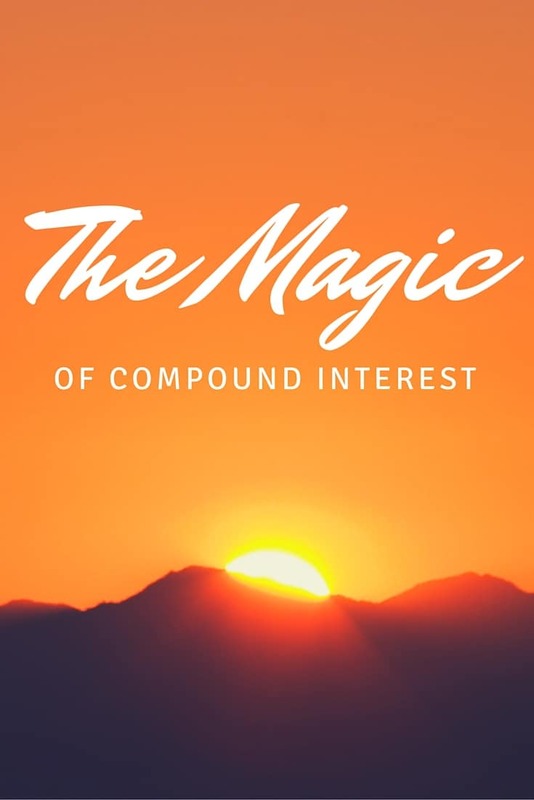 Three, I realized that there really is magic in compound interest. It’s just not on my side, really. It’s on the side of the lenders. As usual. Is it smarter to pay an extra $3-400 a month on a 30-year-note? That’s the more conservative thing to do. My goal is to continue to save half of my after-tax income each year, and perhaps only the 30-year rates would fit into that scheme. Then, I could throw any additional income (from side projects and part time work) to an additional payment each month. What do you do? Do you pay your mortgage more than once a month? That seems quite cheap for 3 bedrooms, although I am surprised mortgage would only be 50% of the monthly costs and all the rest in insurance and dues. I have lived in a few apartments and still own one, it never went over 25% and 75% mortgage. My mortgage is 2.29% so I don’t repay more although the day interests rates get higher I plan on doing so. Do you have a 15 year mortgage? That’s a really low rate! Oh wow, the HOA and tax are quite high. That’s Portland for you. Maybe you can look for a small house close in instead. Our HOA and everything else is about 40% of our housing cost, I guess it is comparable. That’s the beauty of a 15 year in today’s rate climate. It makes total sense to do if you can swing the extra money each month. We do a pretty good job of paying enough to equal an extra months payment each year which knocks off some serious time as well. Other than that we’re in no real hurry to get it paid off. That’s a great price for your condo market! Would you be able to afford the extra money when your debt is paid off? It was a great price! That’s why there were three other offers! A lot of savvy financial people have advised us to get a 30 year loan especially in this low rate market, (it would be different advise if the rates were higher), and invest the difference. Of course not a lot of people have the discipline to invest the rest by increasing their 401K. funding their ROTH IRA, and starting a ROTH IRA. Our plan would probably be to put down 20% in a year, invest the rest, and pay extra every month. A little bit of everything. Just in case you decide to move, you can always rent the house, and still have positive cash flow to cover expenses and more. I like the strategy of taking out a 30-yr mortgage but making payments as if it’s a 15-yr mortgage. Yes, the interest rate will be a bit higher than the 15-yr mortgage, but you’re paying for a sort of insurance. Should you encounter short-term financial challenges, you’ve got the option to back off to the 30-yr payment without offending the lender. But if you sign up for a 15-yr mortgage, you’d have to refinance to a longer term to reduce your monthly payment. 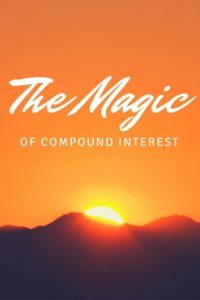 30 year mortgages can make sense if you keep them the entire length, get a low interest rate, and realize you can make more elsewhere with arbitrage. You have to be disciplined though! My current or last mortgage is a 15 year mortgage. I am paying additional principal to have it paid off by the time I retire in 5 years. I have a 30-year, but I make extra payments whenever I can. I specifically made sure my mortgage was pre-pay penalty free so that I can eventually attack it more aggressively. The idea of 15 year vs 30 year is one that I’ve given much thought to. Really, I don’t like the notion of keeping any debt around, so 15 years is better in that regard…..but taking on more risk with a shorter mortgage can be dangerous as well. I think at some level, we need to look at the “sleep well at night factor” when making such decisions!